Welcome to Heritage House Suites, formerly known as the J.P. Carter House and the Thomas Sutton House. Situated in the Historic District of Indiana, on the corner of Sixth and School Streets, between the Indiana Historical Society, also known as the “Silas M. Clark House” and “The Bennett House”. 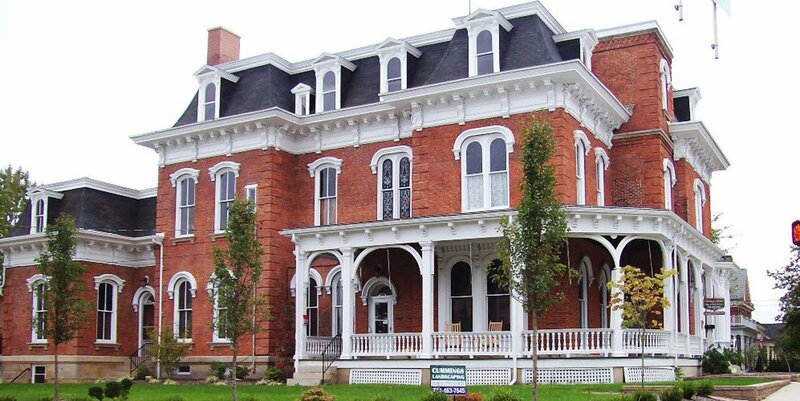 Heritage House is a wonderful example of Second Empire architecture, with French Mansard roofing and features of the Italianate style. It once housed a 3 story observatory tower that had to be removed due to disrepair in the 1970’s. The first record of deed to the home and property is recorded to James P. Carter. All records before that time evidently filed in Westmoreland County, so I have no history of the property before that time. The deed describes a “certain lot or piece of land situated in said Borough of Indiana, adjoining Sixth Street on the west, an alley on the north (School Street? ), land of Rev. David Blair on the east and an alley on the south, (perhaps Locust Street), containing three acres, more or less, with a two-story brick dwelling house, a frame stable and other outbuildings thereon erected”. This deed transfer was dated the Sixth of May, 1874. There is almost no information readily available concerning Mr. Carter, except that he was married to Nancy Ralston and was involved in banking. The deed transfer assigns “all of his properties – goods, chattels and effects and properties real and otherwise” over to Andrew Wilson to be disposed of to settle his obligations to his creditors. (Whereas the said James P. Carter, owing to sundry losses and misfortunes, is at present unable to discharge his just debts”). 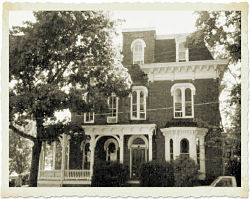 The home and property was sold on November 12, 1879 to Thomas Sutton for consideration of $1,500. There is also a deed transfer signed by his widow, Nancy Carter, releasing all claim to the property. Mrs. Carter and her four sons moved to Allegheny where she died in February, 1899, at age 69. News stories tell of the deaths of her son, Elder, at age 32 of consumptive illness, and of the death of Arthur in a train accident at age 39. Son John’s death was reported in Pittsburgh in 1925. I have found no information on the remaining son, David. Mrs. Nancy Carter was the daughter of David Ralston who was an important area businessman and built the Indiana House. 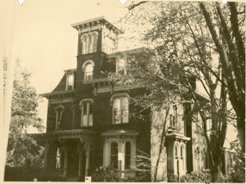 Indiana Progress: 8/4/1870 - The large & costly residence of Mr. James P Carter, on South Clymer Street, is almost finished, and will be ready for occupancy some time the coming winter. This building is of the modern style, two stories high, with a French roof and towering observatory, and when completed will be one of the finest private residences in the Western part of the state. Indiana Progress: 12/5/1872 - Silas M Clark & James P Carter have improved their handsome residences on Clymer Street by having pavements laid around them. South Clymer Street would be the handsomest street in Indiana, was it not for that ungainly building, the Indiana horse stables. It is a shame that so a beautiful street should be this marred. As reported by the Indiana Messenger: 1874 - “The building was finished without regard to cost, and nothing left out that would add to comfort or convenience. The cellar is nine feet high in the clear and divided into five compartments. The first floor consists of five rooms, parlor, library, bed chamber, large dining room, with kitchen, and wash house attached, one and a half stories high, with large cellar under the whole of it. Elegant range in the kitchen, and bake-oven in the wash house. The main hall is wide and spacious, the side hall on the north side is also wide, and in it is the main stair way. There is also a hall entering from the south side; also store room and china closet adjoining the kitchen and dining room. There is also bath room and water closets. Nearly the whole of the first floor is finished in walnut, the entire stairway, railing and steps are walnut. The second floor is component of five large bed chambers, bath rooms and water closet, hot and cold water, gas and every other convenience. The third story constructed with a mansard roof, forms five bed chambers on which also the water tank is located. The grounds surrounding the house three acres and one half, well improved, the fence enclosing the house on three sides is of iron pickets, the residue is of pine palings lately constructed. The grounds are admirably located with flower and vegetable garden and planted in all kinds of fruit, apples, peaches, pears, cherries, plums and other small fruits-in good cultivation. The mantles in the house are all of the finest marble, with marble stationary wash stands, hot and cold water in every room.” In 1875 the Indiana Messenger described the home as “the most valuable home in Indiana County”. Unfortunately Carter and his family only lived in the house for a short while. He fell on hard times financially and with his health declining the house had to be put up for sale. Indiana Messenger: 4/29/1874 - FM Kinter has been appointed Jury Commissioner by Judge Logan in place of JP Carter who resigns on account of failing health. Indiana Messenger: 6/24/1874 - There will be offered at private sale, situated in the borough of Indiana, a fine residence, owned and occupied by James P Carter. It is situated on South 6th Street. The building was finished without regard to cost, and nothing left out that would add to comfort or convenience. The cellar is nine feet high in the clear and divided into five compartments. The first floor consists of five rooms, parlor, library, bed chamber, large dining room, with kitchen, and wash house attached, one and a half stories high, with large cellar under the whole of it. Elegant range in the kitchen, and bake-oven in the wash house. The main hall is wide and spacious, the side hall on the north side is also wide, and in it is the main stair way. There is also a hall entering from the south side; also store room and china closet adjoining the kitchen and dining room. There is also bath room and water closets. Nearly the whole of the first floor is finished in walnut, the entire stairway, railing and steps are walnut. The second floor is component of five large bed chambers, bath rooms and water closet, hot and cold water, gas and every other convenience. The third story constructed with a mansard roof, forms five bed chambers on which also the water tank is located. The grounds surrounding the house three acres and one half, well improved, the fence enclosing the house on three sides is of iron pickets, the residue is of pine palings lately constructed. The grounds are admirably located with flower and vegetable garden and planted in all kinds of fruit, apples, peaches, pears, cherries, plums and other small fruits-in good cultivation. The mantles in the house are all of the finest marble, with marble stationary wash stands, hot and cold water in every room. A.W. Wilson, Assignee for James P Carter. Indiana Democrat: 8/13/1874 - James P Carter of Indiana Borough died on Wednesday evening last August 5, 1874 at twenty minutes to 11 o'clock after a long and painful illness of consumption. The deceased was for many years one of our most energetic, reliable and industrious business men and had spent the prime of his life in our midst. There were few men in the community better known to the business men of the county than Mr Carter and none regarded and esteemed as more reliable and trustworthy. In his large and extensive business connections with the people he had won a name for upright, honorable conduct and fairness in dealing that will be a bright legacy to leave to his children. Failing health induced Mr Carter, a couple of years ago, to withdraw from active business lives but he still took a deep interest in the prosperity of the town. For many years he served the people of Indiana as a school director, and faithfully discharged the duties of the office, being a fast friend of educational enterprises. He was selected one of the Jury Commissioners of the county at the election in the fall of 1873 but his health was so delicate that he was compelled to resign in a few months. In the sacred relations of husband and father, it is not our province to speak at length, but he was kind, considerate and affectionate and it was his pride to adorn and beautify his home, and render happy all about him. He was a good neighbor, a faithful, fine, kind, human and charitable-his hand being open to relieve the necessities of the poor and destitute at all time. James Parks Carter was born at Carter's Store, Nicholas County, Kentucky on the 17th of June 1822 and was married to Nancy, second daughter of the late David Ralston, on the 26th of September 1850 by the Rev. David Blair. He resided in Kentucky from the date of his marriage until the summer of 1852 when he removed to Bell's Mill, Indiana County, Pa where he lived until the spring of 1854, when he moved to Indiana where he resided until his death. His ancestors were originally from Maryland and on his mother's side he was connected with the Parks family of Kittanning, Pa. In his death the community has lost one of its best and most influential citizens. He had united with the Presbyterian Church and died in the blessed hope of immortality. Indiana Democrat: 8/26/1875 - Mr A W Wilson, the assignee of James P Carter, deceased, offered for sale on Friday last the large and elegant residence on South Clymer Street and the one undivided half of the farm adjoining town. The residence and grounds was bid to $16,250 and the farm to $9,100. The sale was then adjourned until Friday next at 2 o'clock pm. Indiana Democrat: 6/8/1876 - The Carter Property is to be sold on Friday--without reserve. Indiana Democrat: 6/15/1876 - The valuable property of the late James P. Carter in this place was bid to $15,000 and then adjourned to July 11th. The undivided one-half of the farm 253 acres was bid to $8,500 and also adjourned. Indiana Progress: 4/4/1878 - Thomas Sutton, Esq has purchased the property known as the Carter property. Does this mean business or a speculation? In 1878, Thomas Sutton was married to Ella Hildebrand, and they “set-up” housekeeping in the house on Sixth Street. He was a very prominent businessman and fourth generation member of a prominent Indiana family. 1879, Thomas Sutton purchased the home and moved in with his new wife Ella Hildebrand. Thomas Sutton was the son of John Sutton, one of the founders of the Indiana Normal School, now known as the Indiana University of Pennsylvania. Thomas Sutton was a lawyer and went to Princeton at the age of 16, he was also a very prominent businessman and community leader. He was involved with the Chilled Car Wheel Manufacturing Company (later to be known as the Indiana Foundry) and with his brother, John, he owned the Strawboard Company (later known as the Indiana Paper Mill Company). He was also owner of the Indiana Chemical Co., along with other local business interests. He served as Treasurer and Secretary of the Board of Trustees of Indiana Normal School, (IUP) and was the President of the Board for 39 years. His great-grandparents, Peter and Phebe Sutton came from New Jersey to Newport on Black Lick Creek, about 1790. They moved on to Indiana to become one of the earliest pioneer settler families. Lots were laid out in the new town in 1805, and by 1806, Mr. Sutton had erected a log hotel on Philadelphia Street and Carpenter Avenue. The first Indiana County Court was held on the second floor of the hotel in 1806 – and the building later became the Wilson Mercantile Store. Peter Sutton was the sheriff from 1808 until 1818. He died in Indiana, PA in 1833 leaving a large family. John Sutton, father of Thomas (and his brother, John) was born in 1814. He was a very prominent businessman, banker and merchant. He was a founder of Indiana Normal School (later becoming Indiana University of Pennsylvania), being a loyal supporter and generous contributor. He was very active in the Presbyterian Church and served in all offices of the church. His involvement with the Sunday School was especially important to him and he served as Sunday School Superintendent for many years. 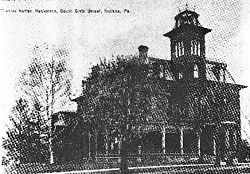 In 1847 John Sutton was married to Mary Agnes Walter, age 21 of Canonsburg, PA. Miss Walter had been well educated and had come to Indiana in 1846 to teach in a seminary located on the corner of Church and Sixth Streets (where Dr. Waldo’s office was located). To this union were born two sons, Thomas and John, and a daughter, Annie, who died “in her youth”. John Sutton died in 1877 at the age of 63. Mary Agnes Sutton remained very active in the church “where time and again, funds from her purse made up the deficiencies in the treasury”. Mrs. Sutton’s testimonials were many upon her death at age 72 in 1898. One particular newspaper account was of a tribute to her from Engleside, of which she was a charter member. It stated that “Among that small number was one whose gentle sweetness and tender womanliness made her a warm place in the heart of the charter members". It attests to her regular attendance, and goes on to say that during her last years, “although frail in health, she always responded”. Entertaining twice in succession, and so lavishly, she said, “Please say no more about it, it may be for the last time.” Then again, afterward, she entertained twice in a row’! Another newspaper article gives an accounting of her entire will. A gift of $5,000 to be divided in eight equal parts among charities of the church - $5,000 in trust, to a sister – to revert again to the Foreign Missions of the church upon Mrs. Blair’s death. Money gifts were left to some family members and jewelry to two grandsons and a granddaughter, Mary Agnes. Her silverware was to be divided between her two daughters-in-law, - and to her grandsons Edward and John (the sons of Thomas), she bequeathed all of her pictures. The remainder of her estate went to her sons, Thomas and John. Thomas Sutton was born in 1854 in his parents’ home on the site of the Indiana Theatre Building. He entered Princeton in 1870 at age 16, and graduated in 1873. He came home and studied law with John Blair, and was admitted to the bar in 1876. He went on to Columbia Law School but had to return home after a year because of his father’s illness and death. He practiced law for a period of time with Silas Clark, a neighbor, who later went on to be elected to the Supreme Court of Pennsylvania on November 7, 1882. The Suttons had two sons. Edward who “ran a large house-furnishing establishment” and was married to Lou Fink of Latrobe in a lavish ceremony, and his brother, John. Edward and Lou moved on to Pittsburgh and had three children. (A newspaper article tells of the death of an infant and its return to Indiana to be buried “from the home on Sixth Street”). An obituary from 1959 tells of the death of Edward who at that time was in residence at the King Edward Apartments. Some information about his family, such as the wedding of a daughter was found, but nothing is available about the other son who resided in Atlanta. In 1903, a news article reports that “more than one hundred friends were entertained by Mr. and Mrs. Sutton at their home on Sixth Street, that being the 25th Anniversary of their marriage.” “The unique feature of the evening was the costumes worn by some of the women who dug-up treasured bridal vestments over which they, (and, of course, their mothers) had spent so many anxious moments in their girlhood days. Some were very old-fashioned and others of more recent creation, but all spoke well for the generosity of the fathers who had to foot the bill for them”. An elaborate supper was served, catered by the Ladies Aid Society, and the home was artistically decorated in silver, pale green and white. Thomas Sutton and his wife Ella threw lavish parties at the house on 6th Street. They also actually held some of the graduation parties for the Indiana Normal School there. There are also pictures and articles in the newspaper of their 25th and 60th Wedding Anniversary parties held at the house. The Sutton’s lived in the house for nearly 70 years and raised their 2 boys John and Edward there. They had a daughter Annie who “died in her youth”. In 1938, a picture and write-up marks the celebration of the Sutton’s 60th Anniversary and tells of a party held in their home. Two members of the wedding party attended the organist and the little flower girl. “The Sutton home was profusely decorated with fall flowers, a beautiful four-tiered wedding cake, baskets of fruit and other gifts to the bridal couple. Son Edward and family attended, John and family did not. Mrs. Ella Sutton died on September 2, 1942, and Thomas Sutton was buried on December 27, 1942. They were still residing in the house on Sixth Street where they had “set-up” housekeeping” sixty-four years earlier. After the home was sold by Edward Sutton, to Mr. Musser in 1943, it was then divided into 8 very different and distinct apartments. Apparently the Musser’s never lived in the home and purchased it as an investment. They painstakingly and meticulously converted the home into apartments. They saved so much from the old house and matched it with new that it’s hard to tell where one period of time ends and the other begins. Over the years there have been countless tenants in the house. Everyone in the county can tell you either a story about Heritage House, they either knew someone who lived there or lived there themselves. 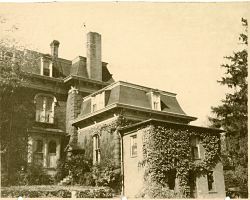 The Musser’s sold the house to John Milicia in 1965 who then sold it to local prominent businessman Murray Varner and his wife Ruth Varner McNaughton in 1975. In 1998 the house was sold to Steadfast Enterprises, a local real estate investor. In 2007 the home was purchased by its current owners, George and Paula Cummings. Sometime over the years the house went from being rented to prominent local attorneys, doctors and widow’s to mostly IUP students. It still had its charm but time had begun to take its toll on the once grand home. We also purchased Heritage House as an investment for students but after evicting a very, let’s say “untidy” tenant, we began the rebirth. We had every intention of putting another student into that apartment but while cleaning and painting the apartment we found under the layers the remnants of “the most valuable home in Indiana County”. To our surprise and delight, many of the original floors were in amazing condition and so were the window shutters, wood moldings, windows and fireplaces throughout the house. The crown molding needed some help and so did the light fixtures and many of the kitchen cabinets. We ripped up the carpeting and found layers and layers of tile and glue and in many cases underneath were the original parquet flooring. Not to mention the major cleaning that the brick on the outside of the house undertook and the new landscaping, walls and sidewalks my husband George installed. As the students graduated, we renovated their apartments. As of now we have 6 beautiful suites finished, most decorated in period furnishings. We offer these fully furnished suites to guests nightly and weekly. We boast that all you need when you stay at Heritage House is food and clothes. Today there are 8 suites in the house. Two on the first floor, two on the second floor, two on the third floor, one on the lower level and a two-story suite located on the east side of the house where the “wash-house” addition was added on shortly after the home was built. Sometime in the 1970’s the third story of the tower was removed because of disrepair and many of the second story tower windows were bricked over. Iron roof crestings and hood molds were also removed at that time. Later in the early 1970’s the entire tower was removed. Over the past few years we have had many IUP parents, visiting businessmen and doctors, IUP grad students, speakers, visiting professors, and even a famous French author, military students and so on. We have also been fortunate enough to host many local elegant fundraising events, weddings, showers and birthday parties. I’m no historian and don’t claim to be, if you have changes or additions, let me know. The information listed in these pages is a conglomeration of information found in books at the historical society, the IUP website, and from friends and neighbors of myself and the house. In my research, I was able to trace the Sutton family back to England in the 1500’s. I couldn’t even do that for my own family. I love this home and I have a passion for it and the history of the people that lived here. I sometimes sit on the porch and close my eyes and imagine hearing the horse drawn carriages going by or hear the music coming from the parlor and people dancing and eating food at one of the many parties.